"Where Real Cowboys Work and Play"
Location of Dubois in Fremont County, Wyoming. Dubois is a town in Fremont County, Wyoming. The population was 971 at the 2010 census, although it nearly doubles in the summer with many part-time residents. 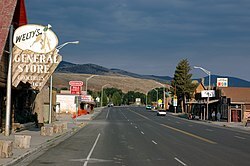 The original residents of Dubois, Wyoming wanted to name the town Never Sweat. However, the postal service found the name unacceptable, so it endowed the town with the name Dubois after Fred Dubois, an Idaho senator at the time. In protest, the citizens of Dubois rejected the French pronunciation, instead opting for Du, with u as in "Sue"; bois, with oi as in "voice". The accent is on the first syllable. The first occupants of the mountains and valleys surrounding what is now Dubois were members of the Sheepeaters, a group of Mountain Shoshone, who included the Wind River area in their regular annual migrations from the Great Plains through the mountains of Yellowstone and beyond. The Wind River Valley surrounding Dubois contains numerous remnants of these people who lived in the area for many hundreds of years before they were relocated into a nearby reservation. Relics of their existence in the mountains and valleys around Dubois include numerous prehistoric petroglyphs, hunting traps and blinds, and stone tepee circles. St. Thomas Episcopal Church was founded in 1910 by Reverend John Roberts, an Episcopal missionary who served the Native American tribes on the Wind River. Charles Moore built the first of many dude ranches in the area, Ramshorn Ranch and Camp Yellowstone, at the mouth of the DuNoir Creek west of Dubois in 1907. In the landscape surrounding Dubois are visible the remains of many wood flumes constructed by the tie hacks who provided the railroad ties that helped to develop the American West. These Scandinavian immigrants cut logs into ties and sent these via the flumes to the Wind River where they floated to Riverton, about 70 miles east, for processing. The Dubois Museum preserves and interprets the natural and social history of the Upper Wind River Valley as the National Bighorn Sheep Interpretive Center focuses on public education about the biology and habitat of the Rocky Mountain Bighorn Sheep with specific focus on the currently largest herd of Rocky Mountain Bighorn sheep in the coterminous United States that winter in the Whiskey Basin of Whiskey Mountain adjacent to the Fitzpatrick Wilderness in the Shoshone National Forest. The Center preserves and interprets the relationships of the Bighorn sheep. The town is on U.S. Route 26 and is the beginning of the Wyoming Centennial Scenic Byway, U.S. Route 26 crossing the Continental Divide at Togwotee Pass. A significant proportion of Dubois residents are writers, artists, photographers, musicians and songwriters, drawn to the remote town in part by its relatively moderate climate and remarkable scenery. Annual cultural events include a national art show and a quilt show, a winterfest including dogsled races and ski-joring, and a workshop for aspiring songwriters led by country music artist Skip Ewing. During summer months, a square dance and a rodeo including local and regional competitors take place every week. On December 30, 2014, several businesses burned to the ground in the downtown area. The air temperatures at the time of the blaze were hovering near -35°F with wind chills in the range of 50 below zero (-50°F). Firefighters battled freezing equipment and gear throughout the night to get the fire under control. The blaze was ruled accidental. The origin of the fire appeared to be inside the rear of the "Main Street Mart" building in the attic above a wood stove. The fire was most likely caused by charring (pyrolysis) that resulted from the chimney coming into contact with building materials. Approximately half a block of Downtown Dubois was destroyed by the fire. In July 2016, a wildfire on the outskirts of Dubois again prompted evacuations. Dubois is located at 43°32′9″N 109°38′9″W﻿ / ﻿43.53583°N 109.63583°W﻿ / 43.53583; -109.63583 (43.535936, -109.635915) and an elevation of 2115 m (6940 ft). The Wind River runs through the town. According to the United States Census Bureau, the town has a total area of 3.43 square miles (8.88 km2), of which, 3.42 square miles (8.86 km2) of it is land and 0.01 square miles (0.03 km2) is water. Dubois experiences a semi-arid climate (Köppen BSk) with long, cold winters and short, warm summers. As of the census of 2010, there were 971 people, 507 households, and 256 families residing in the town. The population density was 283.9 inhabitants per square mile (109.6/km2). There were 625 housing units at an average density of 182.7 per square mile (70.5/km2). The racial makeup of the town was 95.8% White, 0.4% African American, 0.9% Native American, 1.2% Asian, 0.2% from other races, and 1.4% from two or more races. Hispanic or Latino of any race were 0.4% of the population. There were 507 households of which 14.4% had children under the age of 18 living with them, 41.4% were married couples living together, 5.9% had a female householder with no husband present, 3.2% had a male householder with no wife present, and 49.5% were non-families. 40.6% of all households were made up of individuals and 17.2% had someone living alone who was 65 years of age or older. The average household size was 1.92 and the average family size was 2.55. The median age in the town was 51.6 years. 13.8% of residents were under the age of 18; 5.4% were between the ages of 18 and 24; 18.9% were from 25 to 44; 36.7% were from 45 to 64; and 25.1% were 65 years of age or older. The gender makeup of the town was 49.9% male and 50.1% female. As of the census of 2000, there were 962 people, 451 households, and 274 families residing in the town. The population density was 370.3 people per square mile (142.9/km²). There were 556 housing units at an average density of 214.0 per square mile (82.6/km²). The racial makeup of the town was 96.15% White, 0.10% African American, 1.25% Native American, 0.31% Asian, 0.31% from other races, and 1.87% from two or more races. Hispanic or Latino of any race were 1.14% of the population. There were 451 households out of which 22.6% had children under the age of 18 living with them, 49.4% were married couples living together, 8.4% had a female householder with no husband present, and 39.2% were non-families. 32.6% of all households were made up of individuals and 8.9% had someone living alone who was 65 years of age or older. The average household size was 2.13 and the average family size was 2.68. In the town, the population was spread out with 20.9% under the age of 18, 5.1% from 18 to 24, 25.9% from 25 to 44, 29.6% from 45 to 64, and 18.5% who were 65 years of age or older. The median age was 44 years. For every 100 females, there were 99.2 males. For every 100 females age 18 and over, there were 100.8 males. The median income for a household in the town was $28,194, and the median income for a family was $33,409. Males had a median income of $28,125 versus $16,719 for females. The per capita income for the town was $15,657. About 9.9% of families and 12.0% of the population were below the poverty line, including 13.8% of those under age 18 and 3.7% of those age 65 or over. Public education in the town of Dubois is provided by Fremont County School District #2. The district has one campus which serves Kindergarten - Grade 12. In 2014, Dubois Public Schools built onto the existing Elementary/Middle School to create a K-12 school. As of the 2014-2015 school year, the district enrollment for Dubois Schools was 146. - U.S. 26 and U.S. 287 run concurrent through Dubois, on West Ramshorn. The geology of the area surrounding Dubois is unique in the world for featuring (almost in the same view) examples of all three major mountain-building forces: tectonic, volcanic, and glacial. This is described in detail in the nonfiction book Rising from the Plains by science writer John McPhee. The body of Marine PFC Chance Phelps was taken to his parents' home in Dubois after his death in Iraq in 2004. The story is featured in the HBO film Taking Chance. Matthew Fox, (b 1966), actor most known for his work in the ABC drama series Lost. Chance Phelps (1984–2004), US Marine killed in Iraq, subject of the film Taking Chance. ^ Esther Mockler (2015). "Recollections of the Upper Wind River Valley". Pronghorn Press. ^ a b Lawrence L. Loendorf & Nancy Medaris Stone (2006). "Mountain Spirit: The Sheep Eater Indians of Yellowstone". The University of Utah Press. ^ "The Mountain Shoshones". Wind River Rendezvous. 20 (3): 3–5. July–September 1990. ^ a b c Allison, Mary (1991). Dubois, Wyoming Area History. Curtis Media Corp. ISBN 0-88107-179-X. ^ Edward J. Farlow (1998). "Wind River Adventures: My Life in Frontier Wyoming". High Plains Press: 123. ^ Dubois, Wyoming: Historic Walking Tour (PDF) (Map). Wind River Visitors Council. Archived from the original (PDF) on 11 February 2015. Retrieved 28 February 2015. ^ Wyoming Recreation Commission (1976). "A Guide to Historic Sites": 83. ^ "Dubois Museum – Museum Day Venues". Smithsonian Magazine. Retrieved February 10, 2012. ^ "Whiskey Mountain". SummitPost.org. Retrieved February 10, 2012. ^ "National Bighorm Sheep Interpretive Center and Whiskey Mountain Bighorn Sheep Area (WY)". Retrieved February 10, 2012. ^ "US Gazetteer files 2010". United States Census Bureau. Archived from the original on 2012-07-14. Retrieved 2012-12-14. ^ "Monthly Averages for Dubois, WY". The Weather Channel. Retrieved January 13, 2011.